So you've arrived in the City of Light, there's so much to see and do and take in! You can't wait to take in the beautiful surroundings and get lost in your thoughts while exploring little hidden cobblestone paths. But first things first, before even leaving the airport/train station/bus station, you need to work out how to get around Paris. And chances are, you'll want to work out the most cost-effective and (time)-efficient way of exploring Paris too. There are a few options and combinations to choose from, so where should you start? There is the metro, the RER, the Transilien train, buses, trams, Autolib' (car hiring), Velib' (bike hiring), an upcoming Scootlib' (scooter hiring) and of course, your own two feet. There's the single pay-as-you-go ticket option or the all-you-can-eat travel buffet option. Dilemmas dilemmas. For the purposes of keeping this blog post as short and concise as possible, I'll just stick to the two main routes of travel that you are most likely to use - the metro and the RER. Firstly, it's handy to know that Paris and Île de France are divided into 5 zones. All 5 zones are serviced by the RER (the regional train system) while the inner two zones (zone 1 and 2) are serviced by both the RER and the metro. For the most part, you'll be using the metro in Paris, once you get your head around it you'll appreciate its convenience. With 303 stops and 16 lines, the Parisian metro is super convenient to hop on and off. You will always be close to a metro/RER stop in the first two zones and they run from about 5:30am in the morning until 1am or so depending on if it's a weekday or weekend. Generally speaking they come every few minutes, however wait times do become longer during less busy periods of the day. Single use tickets are 1.80€ for a 2 hour journey. It's a bit of a rip off, as that's an almond croissant or a fancy macaron but, it is cheaper than some other countries and I can tell you that it's well worth the money after a long day of walking around Paris, especially if it starts to rain/get windy/snow. If you know exactly where you are going and aren't likely to get off/get on the wrong stop then it's definitely the way to go. A "carnet" of 10 tickets works out to be 14.10€ which is a better deal at 1.41€ per ticket (kids under ten pay 7.05€). These can be purchased at the automated machines (there's an English option!) or, if you'd prefer to interact with a human being, there's always the counter you can head to to practise your French or your Frenglish. Note that the machines tend to prefer cards with CHIPS in them. Also note that at certain stations there will be scammers lurking about trying to "help" you by selling you pre-purchased tickets or even trying to "help" you at the machine. Next step up is a daily pass with unlimited journeys on the metro, RER and bus. Great for people like me who still, after all this time (!) occasionally take the wrong line, get off at the wrong stop and leave the wrong exit. Re-entering again (and.. then again) is never a problem with an unlimited pass! Now, there are two types of unlimited tickets - Mobilis and Paris Visite. Both of them are available for different sets of zones at varying prices, obviously the cheapest one covering zones 1-2 and the most expensive one covering zones 1-5. The difference between the two is that the Mobilis pass is your standard pass and will not cover the airport. Good if you're coming in on the Eurostar or anything else that doesn't require you to go to CDG/Orly. Paris Visite, the more expensive option will cover the airport as well as give you some tourist discounts (so I was told by the friendly RATP man!). It is also available in 1, 3 or 5 day formats. *** BONUS TIP: If you are under 26 and happen to be in Paris on a Saturday or Sunday or a public holiday, you can buy a "ticket jeune" for unlimited travel at reduced prices like 3.85€ for zones 1-3 and 8.35€ for zones 1-5..! If you are under 26 (regardless of nationality) you can also enter the Louvre for free under certain conditions. With all these cards, you can purchase them in advance and then use them when you need to. Remember to write the date and your name on them when you use them and also have proof of age on you if you are using the ticket jeune. Ticket inspectors are everywhere and will happily fine you for the slightest infringement - I was once fined 35€ for not having my photo on my Navigo card (when I had already paid 34€ for the week's travel!). Needless to say, I decided to ride the metro and RER 70 times that week in order to get back the 69€ I had reluctantly forked out in total. Remember that these passes start the day you use them, not the time you use them. So if you first use your pass in the evening, it will still finish at midnight, not the same time the following evening. Best to start in the morning to get the most out of your pass. If you are staying for longer than a few days, it might be worth getting a weekly pass. These are available in the form of Navigo cards, like your London Oyster card and your Hong Kong Octopus card. They can be purchased as a weekly, monthly or yearly pass. The only annoying thing about this system is that it only runs from Monday to Sunday (weekly) or from the first day of the month until the last day of the month (monthly). This has been done on purpose to reserve use for locals however, depending on your dates of travel, this might be the best option. These cards can be bought at any counter. You just need to pay 5€ for the actual card (that you can keep and reload each time you're in Paris again) and have a photo handy (any photo of passport photo size will do) to attach to the card (so that you won't get caught out like me and have to pay a 35€ fine!). Zones 1-5 : 21.25€ (+5€ card fee) - 26.25€ which works out to 18 single trips, so if you are staying for a week and plan on taking at least 2 trips a day, it's going to be worth it, to save you the headache of should I or shouldn't I take the metro..? Also note that as of the 1st of September 2015, this card is part of the "dezonage" ruling therefore it also includes trips to all zones from zone 1 to 5 which will include Versailles, Charles de Gaulle airport, Disneyland etc..! This is the regional train service in Paris. The lines go out to Zone 5 through the suburbs of Paris and even further out. You'll probably only use this line if you are visiting three places, namely CDG Airport, Disneyland and Versailles. There's also the beautiful Fontainebleau castle to visit but the top 3 are those I've mentioned first. I've added the current prices for full fares and reduced (children under 10) fares as well to give you an idea. Once again, hold onto your tickets (as well as those single use ones) in case you get stopped by a ticket inspector. But don't forget to throw them out after you've finished otherwise you'll get confused between the used ones and the new ones! The bus and the tram are great options if you feel like taking on a little challenge. The drawback is that sometimes you can waste time locating the stop in the first place or missing the stop you need to get off at whereas with the metro or the RER, they are much easier to spot and to navigate to and from. I included the tramway option for ORLY airport because it's what I use to get a massive saving even though it's more complicated than the other options. Of course, if you have the time, a bus to look out for is the number 69 bus as it takes you past the most quintessentially beautiful Parisian scenes from west to east, I love hopping on this bus, finding a seat and just going for a ride at times! Having said all that, for me personally (if you have the luxury of time), the best way to get around Paris is on foot. Being five times smaller than London, Paris is a perfect size for walking. You'll be able to take in more sights and really feel like you're in Paris. You'll stumble across surreal emotionally jaw-dropping "oh my god I can't believe I'm in Paris!" moments and discover things you would never see if you hadn't ventured out on foot. Happy commuting and make sure you keep you eyes peeled for pickpocketers when using public transport and especially when the carriages become crowded! PS - For more details check out the RATP website which contains a lot of useful information. This particular link will give you price estimates, just plug in the destinations! PPS - Also, my favourite two apps I use daily over here, are the RATP app (and the SNCF Transilien app) - these are both great as they offer journey planners! Especially for the RATP app, you can plug in your starting address and your destination address then the app will work out the fastest/minimum walking/minimum connections route! Thank you! Yes, walking around Paris and discovering it by foot is the best if you have the option to take your time and explore! 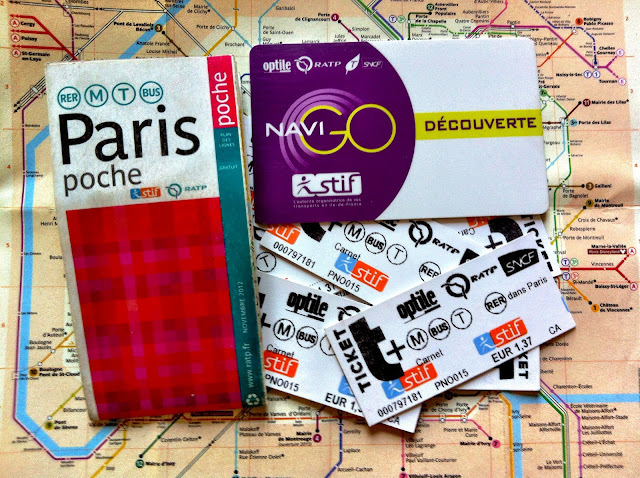 Depending on how far you will venture out of Paris, it might be better to grab a Navigo zone 1 and 2, and then top up with a ticket from the airport, instead of a complete Navigo zone 1 to 5! Paris inspection officers purposely target only tourists. ...on purpose. .cause there is nothing you can do. ..
That's true when I first arrived, I was in for a big shock when I was fined 35€ for not having my photo on my navigo card - and with my limited French it was even worse. Hopefully this blog post will help avoid this kind of situation for others! Ah yes..!! Thanks so much for reminding me, I will add it into the post right now..!! Hello Nhan from Berlin ! My friend and I will be travelling next week to Paris and we were really looking for such a piece where we can get all the information we require. Your blog is very useful and you did a great job in summarizing the paris transportation system. I have some questions regarding our case. We will be arriving at Paris Nord train station and staying near Arcueil Cachan train station, which is in zone 3. Is there any 1-3 zone single journey ticket? During our 3 day visit we will be travelling daily to city center and as suggested by you would like to explore paris on foot. So Paris Visite 1-3 ticket doesn't justify its cost because we will not be using public transport that much and on the last day we also have to take flight from ORLY, for which we have to additionally buy a ticket. Do have any suggestions regarding tickets in our case? Hi there! Thanks for writing, I try my best to be as clear as possible and only include the important information (because there's a lot of information to wade through out there!). Hi ! Thank you for your reply. I read that MOBILIS ticket costs 9.30 euros and for three days that makes it more expensive than 3 day VISITE ticket. Moreover, MOBILIS is not valid for RER B and our hotel is located at ARCUEIL as i mentioned before, which is on RER B line. Ah yes if you need it for more than a day, then go with the VISITE because it should be around 24-25€ for three days, which works out to be under 9€ per day instead of 9.30€ per day. Mobilis should be valid on all lines of the RER A,B,C,D,E though! My friend used it on line B last time she was in Paris without problems. But either way in this case, the VISITE would save you a couple of euros in the end and is the more cost effective way to go! Indeed the card is still 5e. These will change your life!! Hi Nhan, I'm going to Paris in a month and chanced upon your blog and found all the info really useful! I am flying in to Paris via ORLY airport and the tram option that you mentioned sounds really cost efficient and it is something I havent read about! May I know what you mean by complicated? Sounds simple enough from your writing though haha. So I take the T7 tram from ORLY and then change to metro line 7, is that right? Sorry for the delay and yes the tram option is quite cost effective, there are even machines there where you can buy the ticket before you hop on the tram. The only reason why I mentioned that it might be complicated is that you'll need to find the tram station (can be annoying if you are flying in late at night) and then you'll need to change from tram to metro. But I'm sure you'll be find. Worse comes to worst, just ask somebody! Enjoy Paris!! Thanks for your reply! Is the tram station very far away from ORLY? I think I am ok to look for directions, as long as they are not too complicated. One thing good about this method is that I am trying to get to Pont Marie, which is on the same line as Villejuif Louis Aragon. And also, I have a 20kg luggage. Would it be manageable if I take tram and metro? Also, if I am on the tram, I would have to look out for the station and get down at the correct stop right? Will there be announcements or electronic displays to tell me which stop it is?